Dana Point is a historical and modern day seaside destination that is perfect for a family vacation. Its picturesque harbor, shops, restaurants, and beaches lure tourists from around the world, and Dana Point vacation rentals offer a very different way to experience even just a short stay. The town has a distinct atmosphere that is family friendly and everyone can find a balance between relaxation and things to do on land and at sea. Dana Point rentals have what you need to just sit back and relax, unwind, and forget about city life. Enjoy a peaceful morning or a break in the action, or have dinner at your home away from home because you can; a full kitchen is one of the biggest perks of staying at Dana Point vacation rentals. You won't find that in a hotel or motel room. There is certainly much to explore at Dana Point Harbor which has space for thousands of boats. The jetty that surrounds it is one-and-a-half miles long, and within are opportunities to rent boats, shop, or eat at one of the many restaurants. With boating so hot at Dana Point, this offers many chances to get out on the water, whether by yacht, jet ski, kayak, or windsurfing. Take a sailboat out on the breezy Pacific, or a whale watching trip to catch a glimpse of California Gray Whales while they migrate along the coast. Relax on Capistrano Beach or at Salt Creek Beach & Park, which is great for surfing if you're into that. Take along a picnic lunch you made at the short term beach rentals so conveniently located close by. To experience sea life on the intertidal rocks, head out to Dana Point Marine Life Refuge to the west of the harbor. The history of Dana Point can be explored with a visit to Mission San Juan Capistrano. Native American, Spanish, European, and Mexican heritage are memorialized here, and visitors can enjoy the serene gardens and fountains among the mission's 10 acres. Of more interest to the kids is the Ocean Institute, where many learning programs focus on the environment and marine science, held at its land-based facility and on a research ship. There is also the golfing and shopping which are traditional along the California coast but provide everyone with something to do. Dana Point rentals are perfect for a family looking for a diverse array of activities, combined with the ideal amenities and cost to match your vacation budget. Take the opportunity to check out which Dana Point vacation rentals are right for your family. An owner will help guide you through the process and plan an ideal vacation experience. 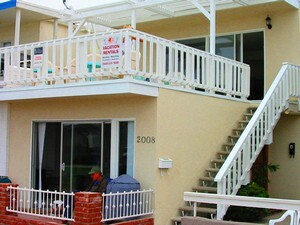 Comfort and convenience are within reach once you get to the short term beach rentals at Dana Point. The adventures you'll have with the family will stay in your head for a long time after you leave this fun and bustling beach town. Interested in More Dana Point, California? Check out nearby Carlsbad , Huntington Beach , Laguna Beach , Laguna Niguel , Newport , Newport Beach , Oceanside , San Clemente .